iBall has announced the Andi 5K Sparkle, Andi 3.5 Classique, Andi 3.5KKe Super and Andi 3.5KKe Glory. 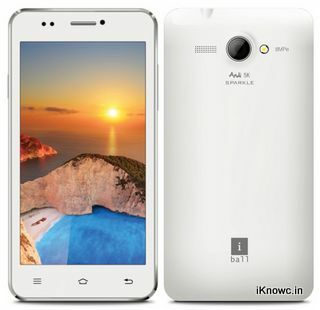 The iBall Andi 5 K Sparkle would compete with Intex Aqua N8 which recently went on sale. The phone comes with Dual SIM support and packs with 8MP AF shooter. The 5-K sparkle has 512MB Of RAM, 4 gigs internal storage and 1.3GHz quad core CPU. The Andi 3.5 Classique, Super and Glory has 3.5 inch display with HVGA resolution, dual core processor and Android v4.2 Jelly bean OS. All the above entry level phone comes with 256MB of RAM, 2MP primary shooter, VGA front camera and dual SIM support. The 3.5KKe Glory has 3G connectivity while the Super and Classique has 2G network radio support. Light Sensor, Proximity Sensor, G sensor. The iBall Andi 5K sparkle is priced at RS 9999 and comes in white color. The 3.5KKe Super and Glory are priced at RS 3,999 and 4,999 respectively.